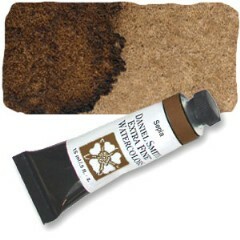 Low staining and lightfast, this transparent black-brown is a palette basic. From its rich, deep state in concentrated strokes, Sepia can dilute to a subtle mushroom hue. Enjoy this transition in washes from near to far or from shadow to light in ploughed fields and farm subjects. Fence posts are fun to paint, as are bulrushes. Try each wet into wet.